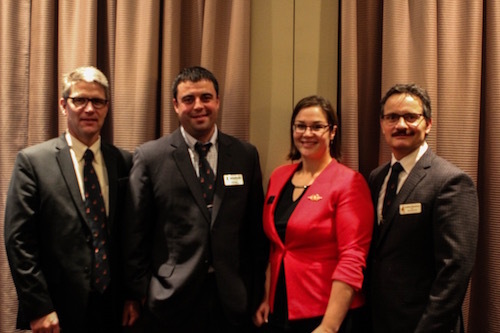 Nuffield Canada held its Annual General Meeting in Calgary, Alberta, in late November. We partnered with the AgEx Conference, an annual Farm Business Management Council event, to encourage attendance at both events. At this function, reporting scholars Greg Donald, Colin Hudon and Becky Parker presented their reports at an evening dinner and were awarded certificates of completion as fully-fledged Nuffield Scholars. 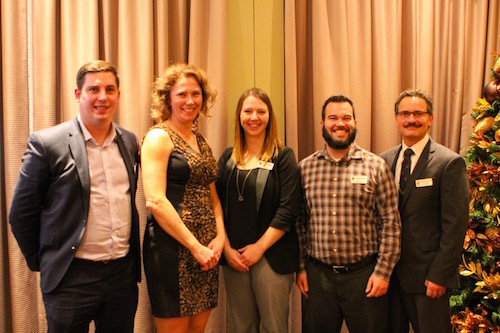 We were also pleased to introduce 2017 Scholars Jason Fransoo (sponsored by Glacier Farm Media), Matt Hamill (sponsored by Western Grains Research Foundation), Nicole MacKellar (sponsored by Grain Farmers of Ontario) and Kristina Polziehn (sponsored by Alberta Wheat Commission) at this same event, where they quickly recognized the value that Nuffield alumni can offer to their networking strategies and travel study plans. Special guests included many of our investor partners. Jim Geltch was also on hand, and provided valuable input to our new Scholar orientation. Thanks, Jim, for including us in your busy travel schedule! Over the past year, many of our Scholars have participated in a wide variety of industry events. Their efforts are helping to promote the program across all sectors and as a result, we’re seeing an increase in awareness at events like the AgEx conference and similar industry gatherings. Our goals for 2017 include increasing the number of Nuffield Canada scholarships awarded to five, with a stretch goal of six. We have expanded the role and time commitment of our Executive Director Shannon McArton, allowing us to focus on securing financial support for a growing number of scholarships and finalize an operational plan that includes succession planning, clear definition of roles and responsibilities and an enhanced communications strategy. Extreme weather created challenges for large areas of primary production across our country this year, ranging from severe drought to record-setting precipitation. The livestock sector suffered set-backs, with slumping cattle prices and the added pressure of a tuberculosis outbreak that has quarantined many operations in Western Canada. The value-added food sector has always been challenged by changes in consumer demand but this has also opened up high margin opportunities for innovative products that provide time-saving options to an increasingly health-conscious consumer. I have spent some time in Eastern Africa recently, with Wayne Dredge and Jim Geltch, meeting with investors and potential Scholars interested in participating in the Nuffield International experience.